Many of you that are just starting out might feel a bit overwhelmed. I get told, “I don’t even know where to begin”. 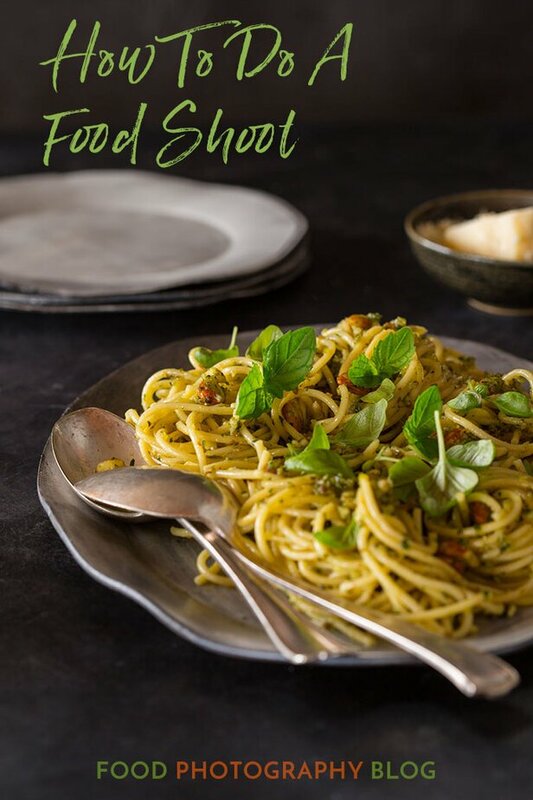 So I will tell you my process for how I do a food photography shoot for my portfolio. It’s a bit different for a job for obvious reasons because of what needs to happen with the client. That will be a later post. 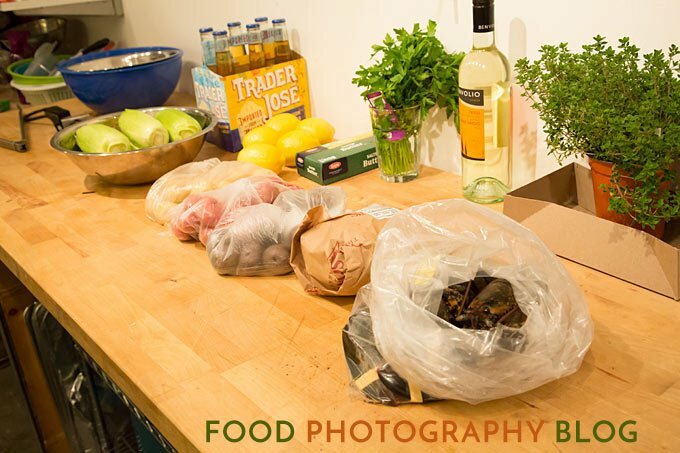 This is a basic step by step process for what I do for my own food photography shoots. When I want to add more images to my portfolio, I’ve usually got some sort of general idea in mind that came from an inspiration. This inspiration could be the farmer’s market, or just seeing some beautiful produce at the grocery store. 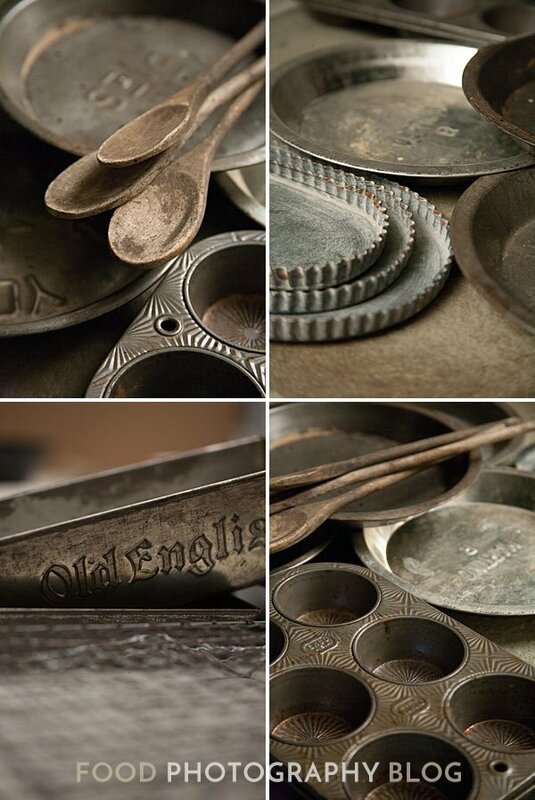 Other times it can come from going to antique stores and looking for amazing dishes as props. One pan can be the base inspiration for a shot. The pan in this shot below came from an antique mall in Long Beach, CA. I knew when I saw it, I wanted to use it for an overhead shot. I called my friend/food stylist Alise Arato and told her what I just bought and said it would be fun to do some sort of an egg scramble. 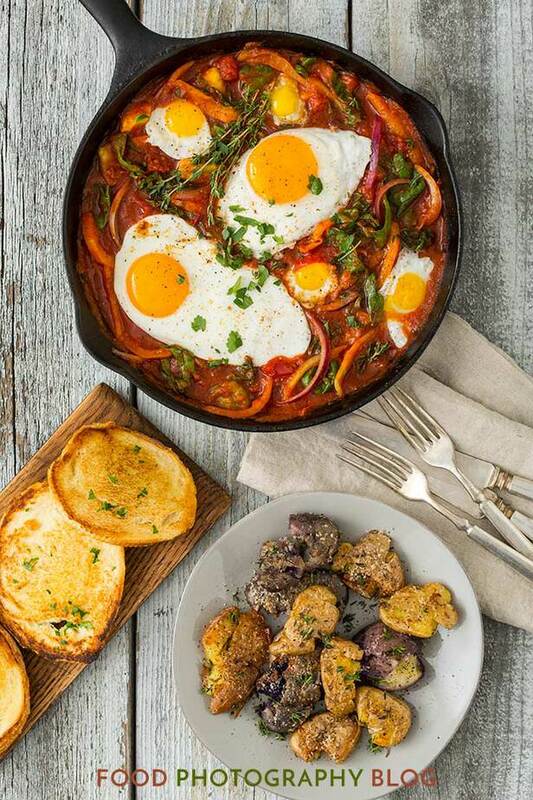 She had the idea of doing the shakshuka. If I don’t have an idea in mind yet, I will look around online to get inspiration from other images. 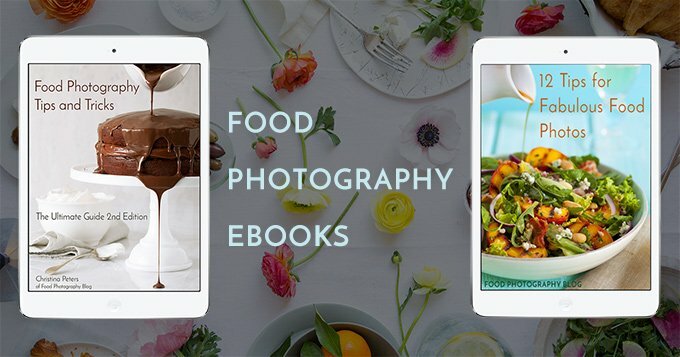 I will often look at Stock Food USA, and also The Workbook to get ideas for things to shoot. Once you have your idea of what you want to capture – now you need to figure out what shots you want, and to make sure you cover everything. I’ve already written a post about making a shot list, so I’ll just summarize by saying to write down your shot ideas in a list. For each shot, break down everything that is going to be in it and write that down as well – background or surface, plates, linens, other props, supporting food items, etc. While you are thinking of your shot list, you need to pre-visualize your shots. What camera angle to you want to use? You camera angle will determine if you will have a background beyond your set (are you seeing off the edge of the table?). How much will be seen in the shots? Your camera angle will also determine what lens(es) you need. Are you doing a close up shot of your food? Or are you doing an overhead shot where you want to show several dishes? Get all this figured out or get some basic ideas of what you want. The more you know about the shot you want to take, the smoother your shoot will go. Depending on what food you are shooting, this can mean a bunch of different things. I always prep at least the day before if not several days before by gathering any new props, backgrounds, and surfaces I need (aka SHOPPING!!! you’re welcome). Prep what ever food you can the day before you shoot if you have a lot of shots in mind. You can precut veggies, put herbs in glasses with water to keep them fresh, bake off anything that can withstand waiting a day to shoot. Don’t be stingy with getting enough food. If you need to show the interior of an avocado for example, you need to get several to ensure you get a good looking one. Get extra food to have just in case. Now that you have all the things you need for your shots, start your shoot day by organizing your kitchen and food prep area, and organize your shooting area. This is my studio kitchen prepped for my lobster bake shot that I’m about to do. I am doing this one by myself so it’s important to really stay organized. I get the kitchen ready to go – I don’t start cooking anything yet. I’m just setting up and getting the lobster pot boiling as that will take time. Then I go to my set and set up my surface for my first shot. It’s going to be an over head shot first. So I set up all my props and compose my shot. This shot below doesn’t have any color tweaking on it yet – the white balance is a bit off but I’m waiting to see the food to adjust that. Once you get your shot composed, you need to get your lighting ready. If you are using natural light, just rough in your fill card because the light will change while you work on your food. If you are using artificial lights – get it exactly the way that you want it so that when your food is on set you, only have minor light tweaking to do. You might need to use a small amount of your food as a stand-in to get your lighting set up. Just take a small amount of any food, even if it’s raw, to frame up your shot as close to what you want and work on lighting that. Now that you’ve got your set and lighting as close as you can to what your first shot will be, you need to make your food. When I prep my shots, I get the plates where I think I want them. Then I mark my plate by placing wood blocks around them. This way when I take them off set, I know exactly where they are going to go. You’ll recognize this image from a few posts ago about 10 wacky food photography terms. 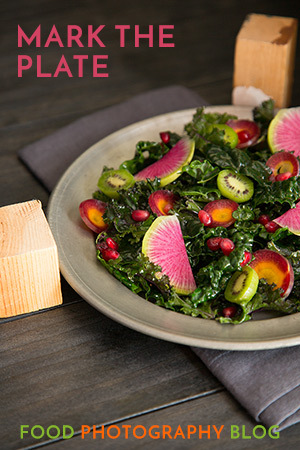 You will probably need to plate some food in the kitchen, then you can finish plating on your set. 7. Bring In Your Food And Start Shooting! Right before you bring in your food, take a shot and check your lights to make sure you got your exposure worked out. If you are using natural light, take a shot and adjust your exposure as it probably changed. Ok, now you are ready to shoot. I always use a tripod so my camera is in position and ready to go. I bring in the food and plate everything. I take a shot and have a look right away as I’m shooting tethered so I can see the images immediately on my computer as they come in. Tweak your food to make it exactly the way that you want. If you are not using a tripod, this will be tricky for you because each time you take a shot, you are moving your frame. Lock your camera down on a tripod so that all you are adjusting each time is your food, your props, and possibly your light if you are using natural light. I will take several shots as I’m working on the food until I get it just the way I want it. Here’s a fun video where I show you frame by frame how I work through a shot. This was for a natural dye Easter egg image. The last step is the final editing process. When I’m shooting with my 35mm camera I use Adobe Lightroom first to capture the images, then I do my minor tweaks like color adjustments, saturations adjustments, contrast, etc in LR. Next I process (export) my files as high res Tiff files. This becomes my digital master file. I take this file into Photoshop then finish my editing. I zoom into my file at 100% and start with the bottom right corner and work my way over the entire image to clean it up from crumbs on the set or anything that shouldn’t be there along with getting rid of any dust spots that might be on the camera sensor. Now my master file is cleaned up, it’s ready for printing, or to be turned into a JPEG for the web. I adjusted my white balance and saturated my colors a bit for this final image. 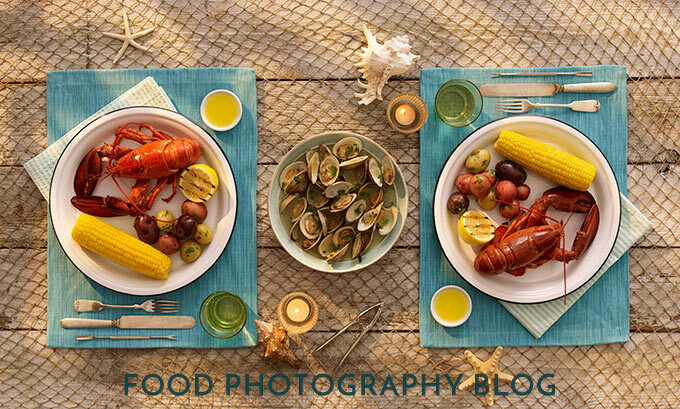 To see my behind the scenes post on the lobster bake photo shoot -click here. 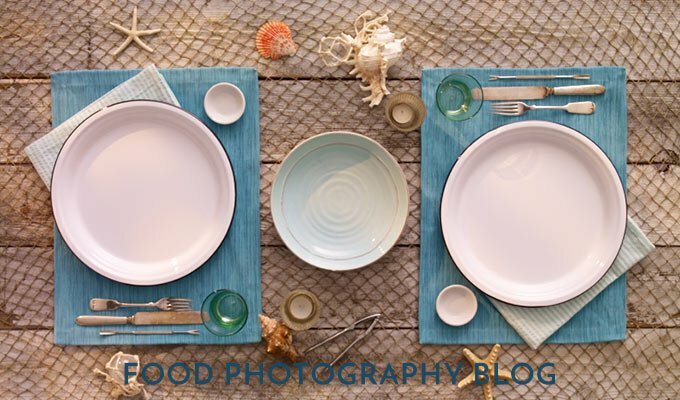 There you have it – my food photography process in 8 steps. For more information about food photography please see my Food Photography Ebooks. If you liked this post please share it on Facebook and sign up below to make sure you don’t miss the next one. This is the post and material I was really expecting, as I was way too confused about how to approach a food shooting! Thank you so much, Christina. Hi Victor – glad you liked it and thanks for reading the blog! thanks for this Christina. A must read I think for restaurant owners who want it all done in half an hour! Hi Jill! Ha – indeed! We’ve all had those clients. This was so helpful with you breaking it down step by step, thank you! Thanks for the helpful article! I’d love to know how long the process takes from start to finish. My photography background is mainly in sports apparel & fashion, but I recently landed a client that wants me doing social media pics for a total of 4 brands. It’s very fast-paced with multiple deadlines each day. So far, it’s been taking me anywhere from 1-2hrs. to set up, shoot, edit, and upload each shot. And that doesn’t include time for planning or trips to the grocery store & Hobby Lobby for props. Am I taking too long? Is there a faster way I should be doing this? Hi Robby, so here’s the thing, food shooting takes a lot of patience. I can’t tell you how long a shot will take because there are so many factors that are different for different types of food. I can tell I always take a lot longer than 1-2 hours for any shoot I am doing. Your fashion world is very fast paced. Many fashion shooters tell me how they can’t stand shooting food because it just takes too long. There is NO faster way of doing this. It’s completely different from photographing people. It takes time my friend. You aren’t doing anything wrong. THANK YOU! I have the patience for it, no question about that. I’m kind of falling it love with it, actually! I just wanted to make sure that I’m not overthinking things as I often tend to do, and often to my own detriment. Thanks for letting me know that I’m on the right track! Hi Robby – ok well then if you’ve got the patience, you’re doing just fine. I actually like the slow pace of it. You’re not overthinking at all.